Approximately 80 Temple affiliates flooded Rittenhouse Square in Center City Wednesday afternoon to protest outside President Ann Weaver Hart’s Temple-provided home. The anger erupted after 19 employees and members of Temple’s American Federation of State, County and Municipal Employees were fired at the end of May. The firings occurred due to a 5 percent budget cut on individual departments, said university spokesman Ray Betzner. 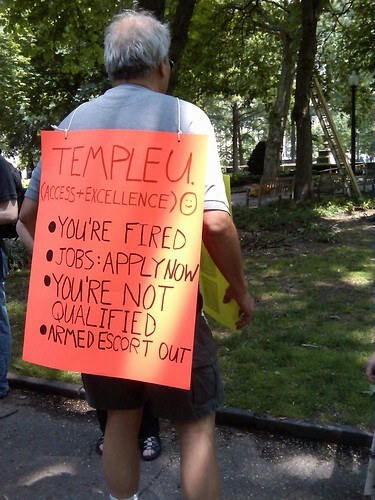 Nine of the employees have been rehired for other positions and the other ten permanently fired, said Temple Association of University Professionals President Art Hochner. Another source of controversy is AFSCME’s accusation of the violation of the contract agreement that major changes will be discussed with the union in advance as well as the way the former employees were treated upon their dismissals. AFSCME is now in the process of filing a grievance against the university. Hochner estimated nearly 100 other firings throughout the university occurred of employees who are either not affiliated with a union or are members of unions other than TAUP and AFSCME. Union members said they are also concerned with what will happen to the work that was being done by the terminated employees, Hochner said. This is the reason I feel that self employment is no riskier than a 9 to 5 no matter what Robert Kiyosaki says.